I wanted to address a couple things regarding this round. Firstly I can't say this enough but thank you all for your amazing support. Not only have you made this round extremely successful but you guys have been providing us with critical information that we will use to make round 2 even better. Secondly there has been a small issue with the C3 capacitor interfering with case placement, I personally have not encountered this issue, but I would still like to address it. Please carefully place your pcb into the case if you feel like it's not properly aligning carefully move it around until it slots in.Thirdly we have been getting sent pictures of plates that seem to be warped, I think the root of the problem lies with how I designed the bottom right row hole and the two side screw holes. Although the plates are rigid these holes can caused warping issues during the finishing process. -Fix smd issue near mounting points. -Shorten side lengths for looser case tolerances. -Fix warping issues by removing the side gaps on the side screw holes. -Potentially add stabilizing bars on the bottom right switch row hole. We have so much planned for round 2 and we are planning to announce it as one big update. Round 2 will be released at the end of October. TheVan Keyboards in partnership with Arhipio is proud to bring you the BananaSplit60 keyboard kit. 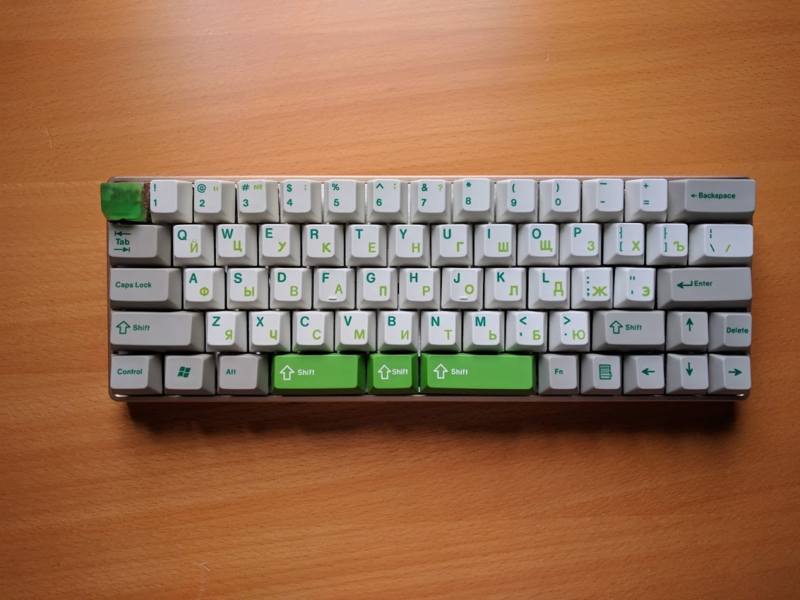 The BananaSplit60 is a 60% PCB featuring a split spacebar as well as layouts that accommodate arrow keys on the default layer. The BananaSplit also supports ANSI and ISO layouts. Including features like top mounted leds, fits standard 60% cases, easy programability using a custom configurator (supports TMK firmware) and the ability to choose between pcb and plate mounted switches. Link to the configurator, create your own firmware without needing to mess with source code! Note: This is a group buy meaning that orders will be taken for a period of 19 days (June 1 2017 through June 19 2017) and once the orders close a bulk manufacturing order will be placed. The lead time from when the order gets placed is 4 weeks. We are expecting to start shipping kits out at the end of July 2017. Re: BananaSplit 60 GroupBuy Live at the vankeyboards.com! Re: [GB] BananaSplit 60 GroupBuy Live at the vankeyboards.com! Is this going to have an IC thread of its' own now? aside from the obvious: price, ETA, color and finish options etc. is there more design detail to finalize? e.g. is the cut out for USB connectors big enough? iirc in the past some of the custom sleeved cables don't fit certain custom cases. It was mentioned in the IC for this board that yes, the case will be done separately, so you should be on the lookout for that. Will be including a sticker with every gb purchase . Edit: All future posts pertaining to the gb will be here. Was it determined if this PCB is holtite compatible? I know it's the same as the minivan but not sure if that PCB works either. There should be no reason it shouldn't be. Cool. I'm planning on putting them in the three switch positions for question mark and 1.75u right shift so I can switch between a normal split shift setup and the modified arrow setup with shift in place of question mark. Best of both worlds. New option for $85, PCB and plate without stabilizers. Entered. I'm sad I couldn't get the case going in time, maybe for R2, haha. If I already ordered the $100 option but would rather have the $85 option, should I just shoot Evan an e-mail for help? We're reverting our change, it's too much of a hassle to change how our system was setup. Especially going back and changing tons of orders because of the change. Work on 3D-printed 5mm plate is going well. Only missing the screw-holes now and need to split it up so I can properly print it. This is pretty much the standard layout except I put a .75u blocker between ? and up-arrow. I think this will be more aesthetically pleasing, especially because my keyset doesn't have an orange 1.75u key and I don't want to try and dye one to match the colour. In the beginning I also wanted do make both spacebars 2.75u and put a .75u blocker between those, but that makes it harder to press some key combinations that involve F1-F4 (right space will be Fn and maybe Enter as well). The problem with that is also that it makes the gap and material-difference between the plate and case very visible, which would probably look bad. Looks awesome can't wait to see it come to fruition. Thanks everyone for all the support we are currently at 81 orders. Ordered mine as well, first custom build here I come . This pcb is very interesting, but not having soldered before, I'm worried of making a mess with an expensive PCB. 22$ for shipping to Germany seems a little steep, but I guess it's insured and tracked properly, so as long as it gets here safe, I can deal with that. Soldering is really easy to get into, if you have an old board you don't use you can practice desoldering and solder on that before hand. Awesome thanks a ton . International shipping is always super annoying sorry about that. Too many options, and you can always change it out if you want to try something different . 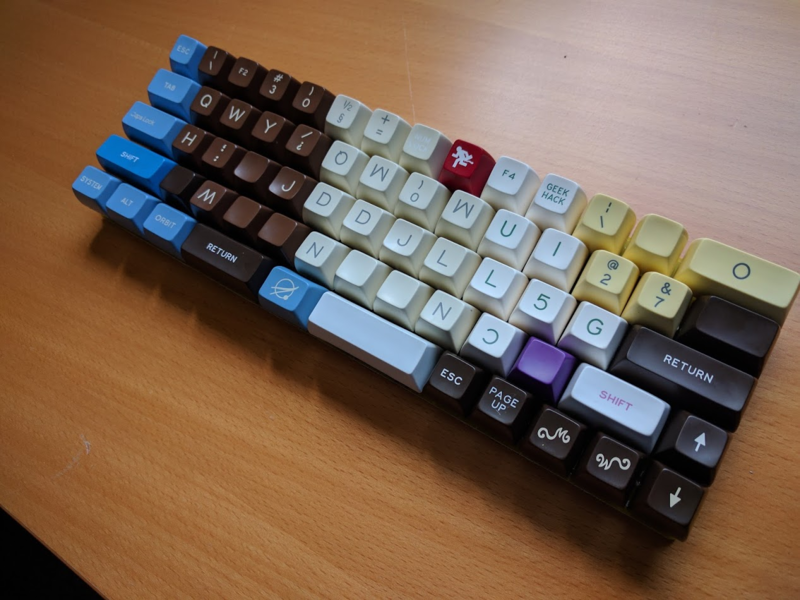 My latest bananasplit build featuring grab bag caps. We're at 94 orders thanks for the continued support everyone! Interested. Btw, what is the 6u stab used for? And can I opt for only plate and pcb w/o stabs? The 6u stab is used for standard 6.25 spacebar if you decide to use one. We have an option for this on the gb page. Ahh yeah that makes sense. Im stoopid. Btw in the GB page, the PCB+Plate-Stabs=$115? As oppose to PCB+Plate+Stabs=$100? Was it intentional? It's intentional, we want people to get the genuine stabilizers. But if people opt out they are more than welcome to. Haha thats illogically weird. Good luck with the GB anyway. Evan just finalized the configurator for the BananaSplit60. I know evangs run tight group buys. Looking forward to this kit. 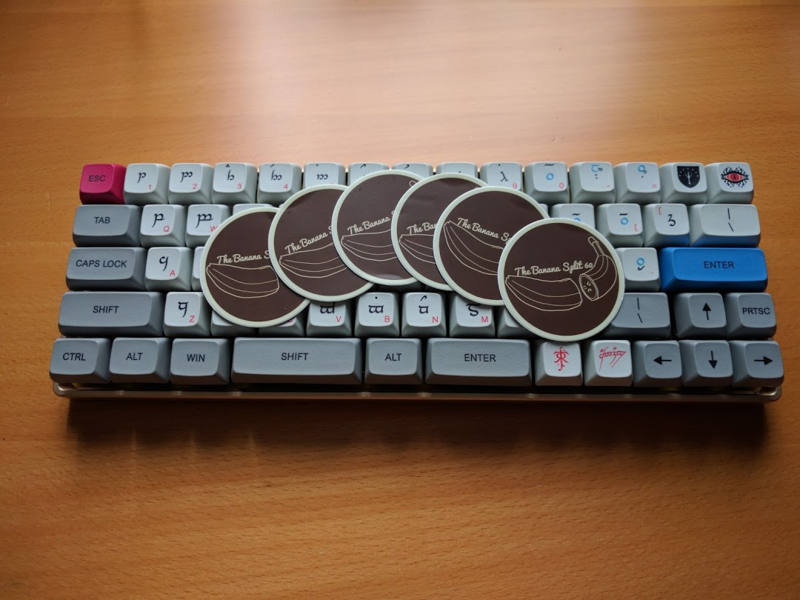 Does it support QMK as well? 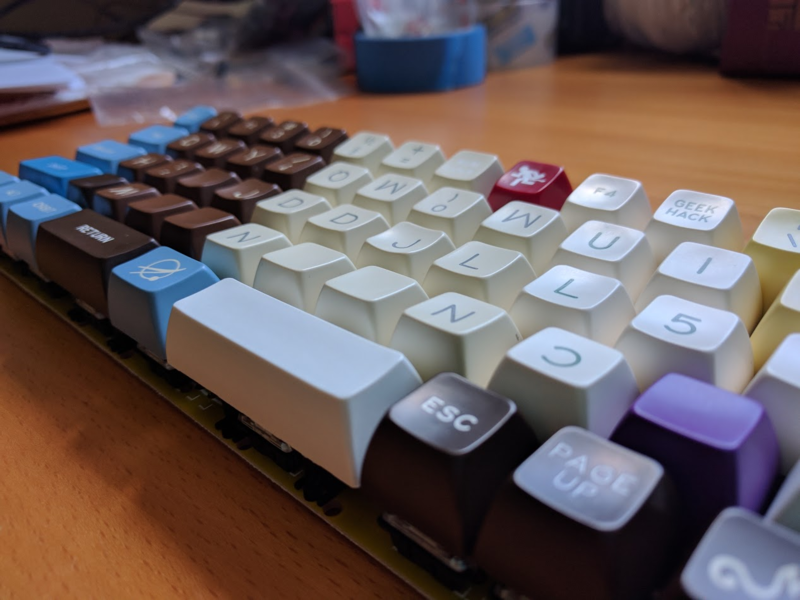 As it uses TMK porting to QMK should be no problem, but there is no mention of the controller that the bananasplit will be using. Sounds good! I'm new to this so how complicated would porting from TMK to QMK be? I don't mind learning. Just want to know if there are downsides. The reason I'm asking is because I wonder if it'll be compatible with a Nordic ISO layout, utilizing the AltGr key. Looking at the configurator, I couldn't find anything resembling AltGr. Am I missing something? Totally agree on looking forward to the minivan pcb! ...I couldn't find anything resembling AltGr..
Banana Split has an ISO layout option, and the RALT in the config would be AltGr wouldn't it? Just joined, can't wait to build it! What is your preference when using a split spacebar, the 2.75u on the left or the right? I'll relay that to evan, might be something we overlooked but easy enough to implement. Thank you for pointing that out. Thanks for all the support guys we just hit 113 orders. Page created in 0.138 seconds with 88 queries.